South Korean President Moon Jae-in said on Tuesday that next year’s joint military exercises with the United States might be postponed until after the Olympics. First torch bearer, South Korean figure skater You Young, center, runs as she holds an Olympic torch during the Olympic Torch Relay at Incheon Bridge in Incheon, South Korea, Wednesday, Nov. 1, 2017. In the last two years, North Korea has accelerated its missile and nuclear development program. Last month, the country’s state media announced it had the ability to hit the U.S. mainland with an intercontinental ballistic missile. The Moon administration calls the February games the “Olympics for Peace.” Moon's government has been urging North Korea to take part, to both calm the region and encourage future talks. Critics do not believe North Korea will change its actions in response to Moon’s words. 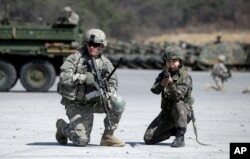 Delaying the joint drills could also help improve relations between South Korea and China. Relations between the countries have grown difficult over South Korea’s deployment of the U.S. THAAD missile defense system. China objects to the system's powerful radar that can potentially see far into its territory. FILE - A U.S. Army soldier and a South Korean Army soldier take their position during joint military exercises between South Korea and the United States in Pocheon, north of Seoul, South Korea, March 25, 2015. The North Korean Olympic Committee missed the Oct. 30 deadline to register for the winter games, but the International Olympic Committee has said it is still not too late. Two North Korean skaters are the country’s only athletes to qualify for the winter games so far.